Author: Giuseppe Nisticò, David J. Pascoe, Valery M. Nakariakov, and Christopher R. Goddard at CFSA, University of Warwick. A very interesting example of magnetohydrodynamic (MHD) wave activity in the solar corona has recently been observed by the Atmospheric Imaging Assembly (AIA), on board the Solar Dynamics Observatory (SDO), in the form of wave trains, i.e. several arc shaped disturbances of the EUV emission propagating away from a flaring region [1,2]. We present an observation of a high-quality quasi-periodic wave train that developed in a funnel structure detected near the south-west solar limb in SDO/AIA 171Å on 7th December 2013 . The wave train was observed in active region NOAA 11909 (S17 W62) after a flare of GOES class M1.2. In addition, a coronal mass ejection with a projected speed of 900 km/s has been registered in the LASCO field-of-view. The time sequence showing the formation of the wave train is given in Fig. 1. Figure 1. 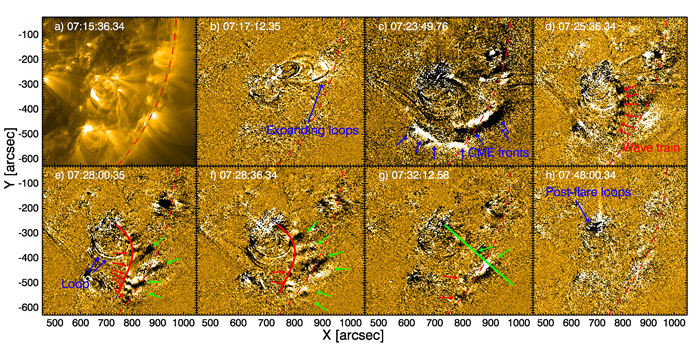 Sequence of frames from SDO/AIA 171Å showing the formation of the wave train. Figure 2. 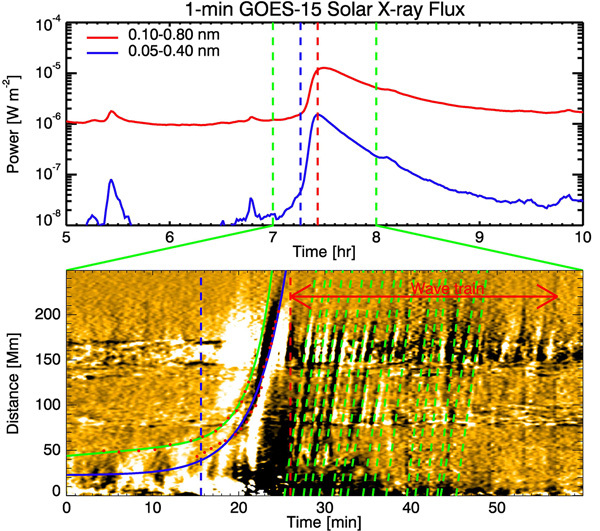 Top: X-ray fluxes from GOES-15. Bottom: time distance map from the green slit plotted in Fig. 1. During the starting phase of the flare, several features (highlighted by coloured arrows) can also be seen, such as expanding loops, the shock/CME fronts, the formation of a first chain of a wave train along a curved path (in red) in a closed magnetic field region, and the subsequent development of wave train fronts on a larger scale (crossing the green line) in an open magnetic field region. Time distance maps, constructed from the slits following the path of the wave train, show a large number of fronts, so that the observed wave train results to be “high quality”, i.e. a large number (> 10) of fronts has been observed. Figure 2 associates the GOES X-ray flux with a time distance map. After the flare peak (vertical red dashed line), several strips mark the propagation of the wave fronts, fitted by the green dashed lines. Typical speeds range between 900-1200 km/s, periods in the range 50-90 s, and wavelengths around 60-110 Mm. Figure 3. Numerical modelling for the fast wave train. Top: dense and stratified coronal loop in a modelled active region. Middle and bottom: Evolution of the perturbation speed of the plasma from an single pulse localised near one of the loop footpoint. A fast wave train, guided by the dense loop outlined by blue lines, is generated and propagates away from the location of the pulse. We performed a numerical simulation with Lare2D to reproduce the observed wave train features, such as the propagation of wave train fronts along the curved path, and the large scale fronts in the funnel. The numerical modelling, which is an extension of the model given in , consists of an active region with a potential magnetic field (white lines in Fig. 3-top) and a density-stratified coronal loop. A compressive (thus sausage) perturbation near one of the loop footpoints models the impulsive driver (Fig. 3-middle). Being denser than the background and with a reduced local Alfvén speed, the loop acts as a waveguide for fast magneto-acoustic waves excited by the impulsive driver. Fast sausage oscillations are generated within the coronal loop with a broad range of wave numbers and experience dispersion due to the transverse structuring. The components of the wave train with a wave number greater than the sausage-mode cut-off remain trapped in the waveguide, while those with a sufficiently small wave number gradually leak out of the loop and form the outward-propagating fast wave trains in the external medium, in a similar way to the large-scale wave train fronts in our observations (bottom of Fig. 3). This can also be seen in the animation in Fig. 4 where we compare the wave train observed with SDO/AIA 171Å to the corresponding evolution of the perturbations of the plasma density in the numerical simulation (the numerical box here covers the right half of that given in Fig. 3). The starting time of the simulation coincides with the flare peak and the simulation runtime corresponds to a physical time of about 5 min. Figure 4. 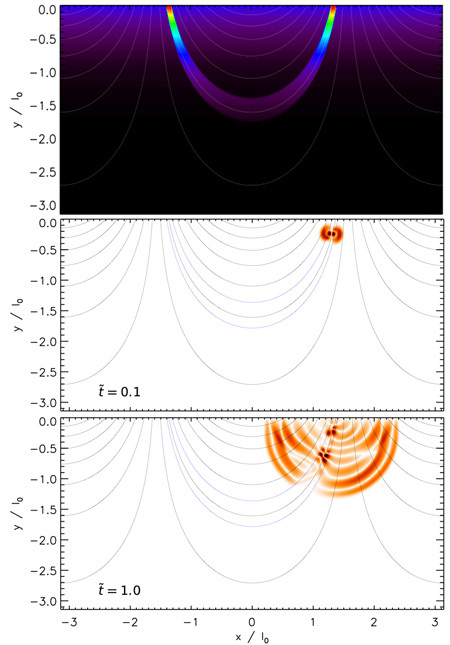 Evolution of the wave train observed by SDO/AIA (left panel) compared with plasma density perturbations from a numerical simulation of a flaring active region (right panel). Fast magneto-acoustic wave trains in the corona can be generated by an impulsive driver, such as a flare. Previous studies [1,2] showed the periodic releases of energy (flare pulsations) could excite wave trains. On the contrary, we show that a single impulsive energy release can lead to the formation of high quality wave trains, which are the result of the dispersive evolution of fast MHD waves due to transverse structuring of the corona. We are continuing to investigate the relationship of wave trains with flare pulsations, CMEs and/or in association with additional MHD waves modes .